April 19th, 2019 & Get An Additional $199 Bonus… FREE! Privacy Assured: We HATE spam and promise your email address is never shared with anyone. Here’s everything you’re getting INSTANT ACCESS to today…. 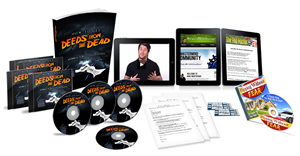 The Deeds from the Dead 4-Hour Audio Training Course containing absolutely everything you need to know about making money with probate real estate! A 42-Minute Jumpstart Video with Preston, walking you through the process of buying & selling probate real estate from A to Z! All the Forms and Contracts you need to make this stuff happen! Two (2) Tickets to our next LIVE VIP Mastermind Event! Complete the checkout process below! The first name is incorrect or missing. Sorry, no numbers or special characters allowed. Please use letters only. The last name is incorrect or missing. this email is already signed up in our system. Sorry, you did not enter enough characters. The phone number is incorrect or missing. Sorry, your phone number does not appear to be formatted correctly. Sorry, you did not enter enough digits. The cart type is missing. Sorry, the zip code you entered does not appear to be formatted correctly. The credit card number is missing. The credit card number must be digits only. There do not seem to be enough digits in your credit card. You must enter the security code on the back or front of the credit card. There do not seem to be enough digits in your cvv2. The expiration date is missing. The expiration month is missing. The expiration year is missing. The cvv2 must be digits only. The street address is missing. Sorry, the street address you entered does not appear to be formatted correctly. Sorry, you must have more characters in your address. Sorry, the city you entered does not appear to be formatted correctly. Sorry, you must have more characters in your city. The zip/postal code is missing. Sorry, the zip/postal code you entered does not appear to be formatted correctly. CLICK THE NO THANKS OR RETURN TO PRODUCT OPTIONS BUTTON RIGHT NOW FOR A CRITICAL ECONOMIC MESSAGE FROM PRESTON ELY. April 19th, 2019 & Get An Additional $199 Bonus... FREE! 2019 Real Freedom Inc, All Rights Reserved.